I found out after spending an afternoon with Mark that he is a very ambitious man and seems to always have something going on. He is a devoted family man who manages to drag race, run a business, and play semi pro hockey two nights a week. He also spends a lot of time working out as his hockey playing body is well past the normal expiration date - but he still manages to be competitive. 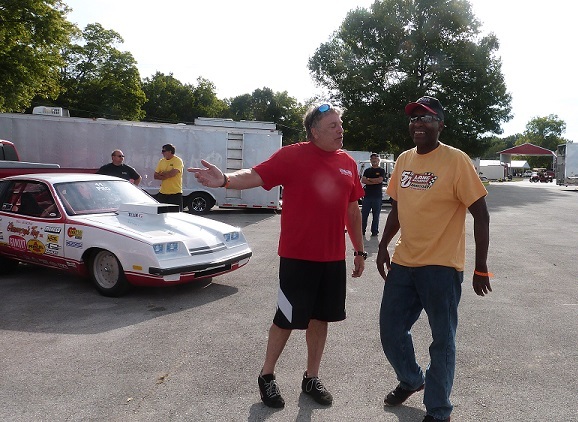 He told me that he feels blessed to be able to drive two of the most influential Chevy drag race cars of all times and he is extremely pleased with the direction that Nostalgia Pro Stock racing is going. “I am having a lot of fun” Mark said with a smile as he showed me his design plans for his new race shop. The next time you are at the races stop and see Mark to say “Hi” from us. have a mutual respect and admiration for each other and our actually good friends off the track.